On football weekend Fridays, guests of the University of Notre Dame Fighting Irish can walk — for free! — the tunnel every Irish football player has taken into Notre Dame Stadium since the Knute Rockne era in 1930. 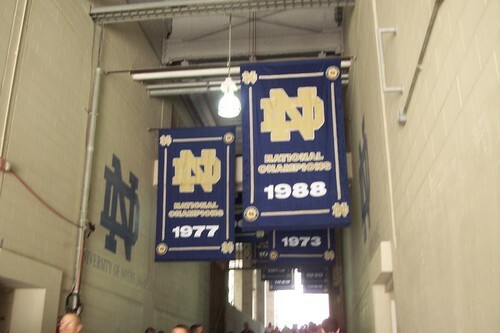 View the hanging national championship banners, take a photo with the field in the background, and imagine what it’s like to race into the stadium to the rousing Notre Dame Victory March and the cheers of thousands of fans! Note: This is my take on Story, this week’s WordPress Photo Challenge topic. The idea is to use a photograph to convey a story. Kind of relates to the English idiom, “A picture is worth a thousand words,” don’t you think? This entry was posted in Photo Challenge and tagged Fighting Irish, Notre Dame, stadium, story, tunnel tour, wp Photo Challenge. Bookmark the permalink. That and the grotto always move me. Well and the Dome. TD Jesus too. Aw, the whole place. Thanks, Debbie. Isn’t that the truth, John? Such a beautiful campus. So much tradition. And now, so many memories! I agree with John but I’d have to add the Basilica since that is where I got married! HaHa! Can’t you just see me in all that attire?!? If they’d given me the option, I’d have been in, but no, just the tour (such as it is). I imagine it has more oomph for those who attended! You said it, Debbie! And what a fantastic picture! I’ve seen photographs of the Notre Dame campus at it’s absolutely stunning! The architecture is breathtaking. It’s like stepping back to another time. The interior of the Basilica looks incredible! Have a FAB rest of your week, my friend! Thank, Ron. You’re so right, the campus is a feast for the eyes. Everywhere you look, you can see beauty, whether of the natural or man-made kind. And just thinking about all the famous and not-so-famous folks who attended ND kind of makes for a humbling experience. I know most grads are hoping for a return to the “glory days” of the past, especially as regarding their sports teams though! If I were any kind of a football fan, that would be quiet an experience, no matter which team I followed. I used to be a fan of a pro team or two — I grew up watching the Green Bay Packers with my dad — but my interest faded over the years. For you? This would be heaven — or at least something close. Thanks for the peek into a tradition I didn’t know existed. Thanks for coming along, Linda. That part of the football weekend experience was fairly short, but it was enjoyable. More enjoyable — to me, anyway — was all the Band-related stuff, the games themselves, and the gorgeous campus. I grew up loving football, thanks to my dad. He didn’t play, but he enjoyed watching the games on weekends. I suspect being in college band only fed my interest! Lovely! I need to consider what I have (or could take) that will tell a story. And I’m curious if your band has played a concert yet? YES!!! I thought I was going to shake to death before we started playing, but once I got into the music, I was fine. And our director said we played well (though our low brass totally fell apart in our second song!) Our next concert is in April, and this one I’m looking forward to. Thanks again for your gentle nudge!